Need Some Help Going Paperless? 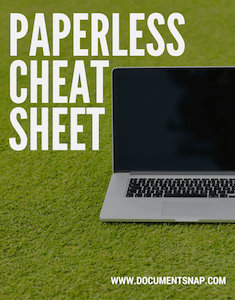 I’ve been paperless since 2008, and I created this free Paperless Cheat Sheet just for you. See the best hardware, software, and tools to go paperless the right way. My free guide to getting your paperless documents under control. Organize and find your information in 4 easy steps. I’ve used a Fujitsu ScanSnap since 2008. Here is how to set it up and use it in easy to read, friendly English. I’ve collected all the information you need to know about Evernote in one easy and free place. No need to hunt around online. BROOKS IS JUST THE BEST. Worth every penny! I just wish I had a person like Brooks for every area of my life. Use a fast scanner with a document feeder to quickly and easily turn your paper into a searchable PDF. Make your documents searchable and set up an easy to use process to quickly find your documents when you need them. Make sure your documents are safe and secure. Have an automated backup and recover from anything quickly. Use these hardware and software tools to go paperless the right way.